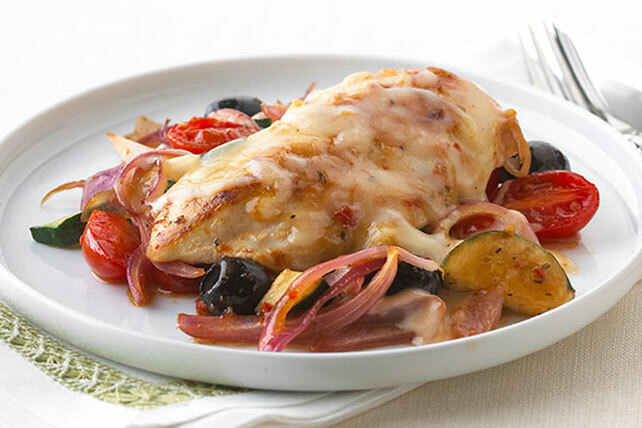 This smart recipe for mozza-chicken means you'll be making lotsa chicken. Tuscan dressing and melty cheese means they’ll ask for this one again. Heat large nonstick skillet on medium-high heat. Add chicken; cover skillet with lid. Cook 5 to 7 min. on each side or until chicken is done (165ºF), adding onions and zucchini after 5 min. Add dressing, tomatoes and olives; cover. Cook on medium-low heat 2 min. or until heated through; stir. Top with cheese; cook, covered, 2 min. or until melted. Serve with hot cooked rice and/or cut up pita bread. Substitute cherry tomatoes for the grape tomatoes.